JAAS Advanced Manufacturing Software (JAMS) integrates with the Acumatica Suite to deliver a powerful solution for multiple manufacturing environments; efficiently managing inventory, costs, and processes. 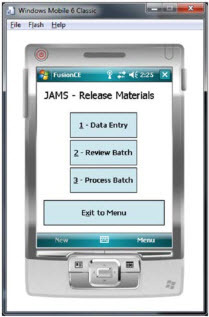 Fusion Shop Floor Data Collection allows remote entry of critical data via hand held devices integrated with JAMS. A consistent launch screen mirrors the processes in JAMS. Shop Floor Data Collection is both easy to learn and use. 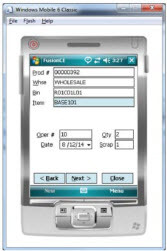 Barcoded Production Ticket Delivered as part of the core application, Fusion Shop Floor Data Collection provides barcoded Production Tickets. These Production Tickets, or Travelers, follow the Production Order throughout the manufacturing process. 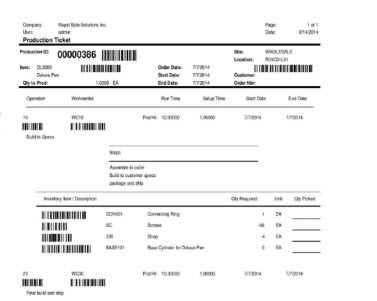 Unique barcodes are associated with each ticket; production step, inventory item, and employee. Work center entry can be accomplished by scanning the barcode on the Production Ticket or the work center itself. Barcoded employee badges allow for easy labor entry. Data Entry is simple, scan the Production Ticket number and the Warehouse is defaulted in, as is the date; which the operator can adjust if necessary. Scan the Operation number and begin selecting items and quantities along with bin locations. Unit of Measure, pulled from Acumatica, is defaulted into the order, but can be changed as needed. For multiple items, simply enter “next” and repeat the process. 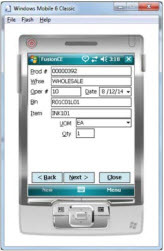 Scan the Production Number and Fusion Shop Floor Data Collection will default the warehouse and the item. Once the Production Number is scanned, scan the Operation. By scanning the Operation, the date will default, but can overridden, if necessary. 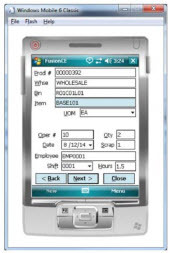 Enter Employee ID by scanning the Employee badge and select the shift (in multi-shift environments). Enter labor hours and proceed to the next operation. The end of the production is noted by moving the item(s) to finished goods inventory. Scan the Production Ticket number, which will default all required information; scan the operation, enter the quantity, including scrap, when required.